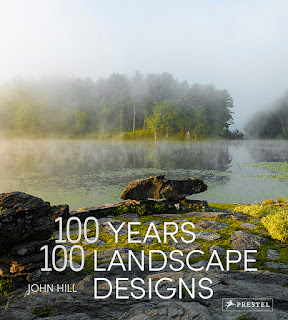 This week's dose is a departure from the usual focus on contemporary architecture, instead featuring an early 20th-century building that I visited as part of the Open House New York (OHNY) weekend. 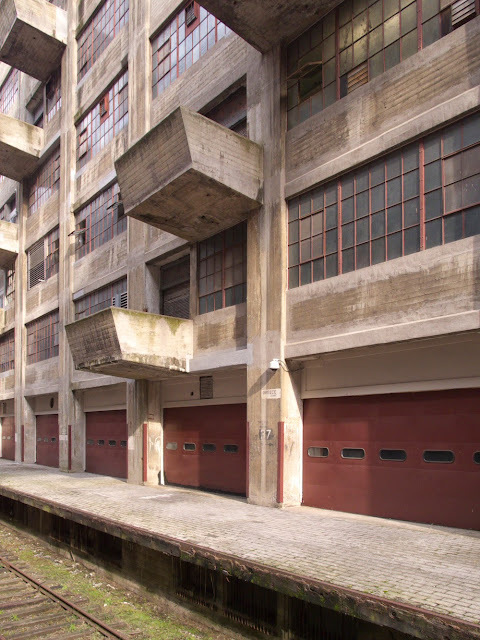 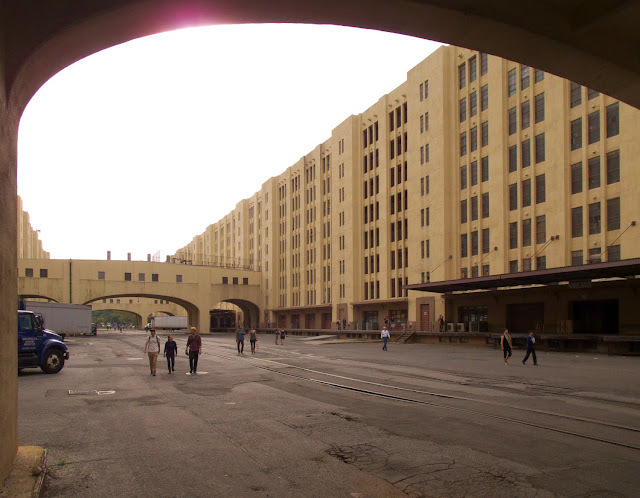 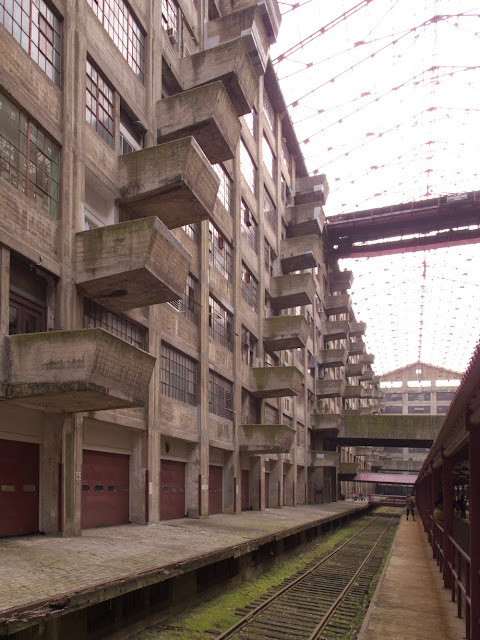 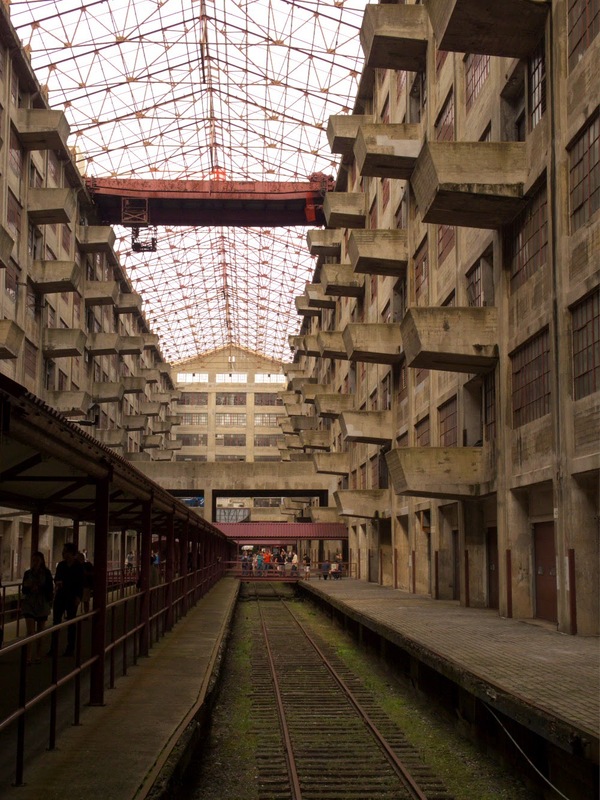 What's now known as the Brooklyn Army Terminal was designed by Cass Gilbert as army warehouses during World War I. The two long buildings overlooking New York Harbor were completed six years after Gilbert's Woolworth Building, but the concrete buildings west of Sunset Park, Brooklyn, are a suitably sharp departure from the ornamentation of the famous tower overlooking City Hall Park. 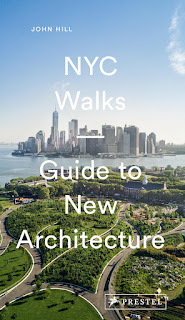 Reaching the buildings is usually not an easy feat, but thankfully OHNY had arranged for ferries from Pier 11 near Wall Street. 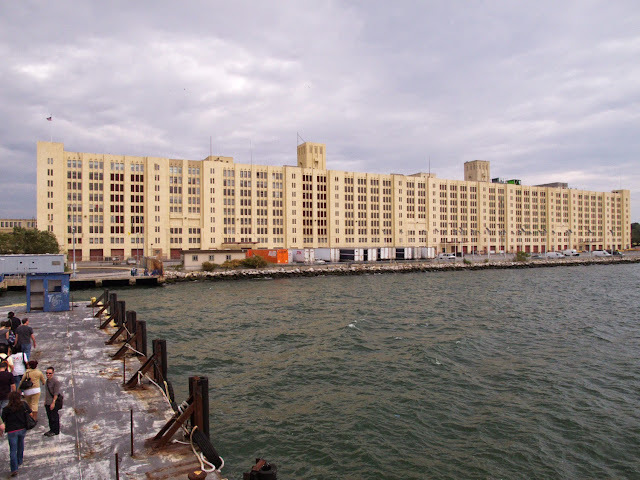 The 22-minute trip was a great lead-in to seeing the buildings, partly for the view of Building A from the water (photo at top-left) but also for glimpses of the borough's changing shoreline, from Brooklyn Bridge Park to the various parts of Red Hook: the shipping container terminal, the massive cruise ship docked nearby, and the unmistakable IKEA store further north. Likewise the Brooklyn Army Terminal has transformed itself into "the premiere location for tenants who are in the business of innovation." The Terminal's Building A and Building B add up to a whopping 5 million square feet of usable space (construction time was an even more whopping year-and-a-half), but the OHNY visit was all about Building B. 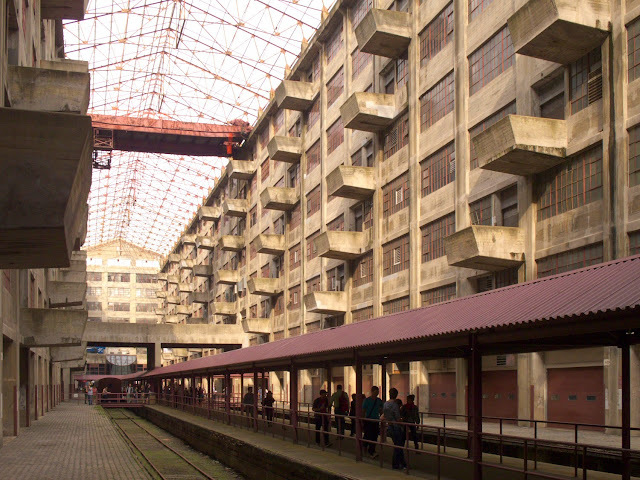 While they are both the same length (just shy of 1,000 feet, or 300 meters), Building B benefits from an atrium that runs down the middle from almost end to end. 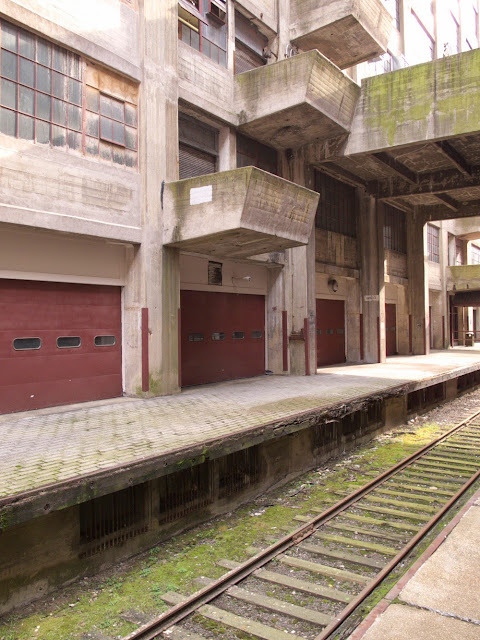 At the level of the loading dock are two railroad tracks separated by a walkway in the middle. 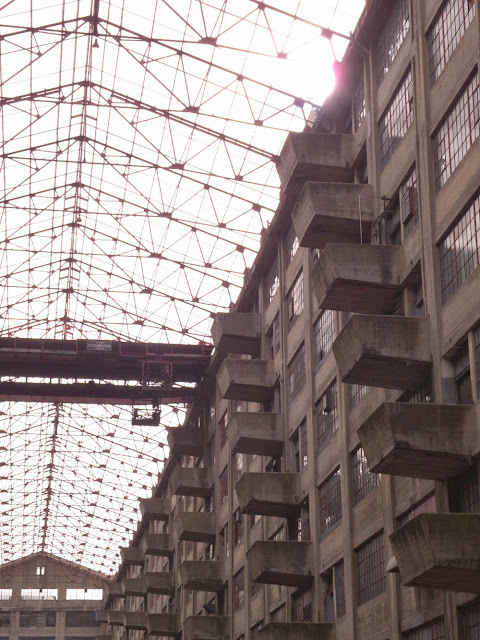 Immediately beneath the roof's truss-work are tracks for a rolling crane positioned about halfway down the length of the space, above a concrete bridge that links both sides of the building at the third floor. 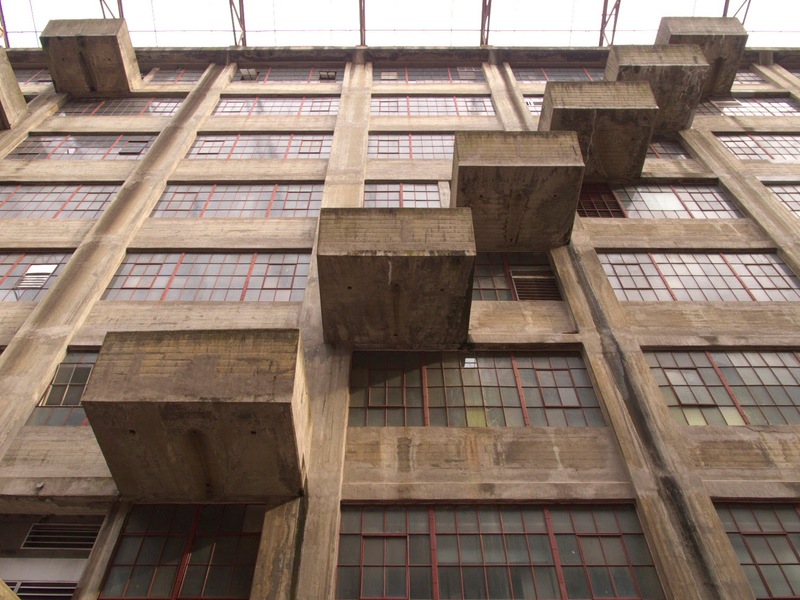 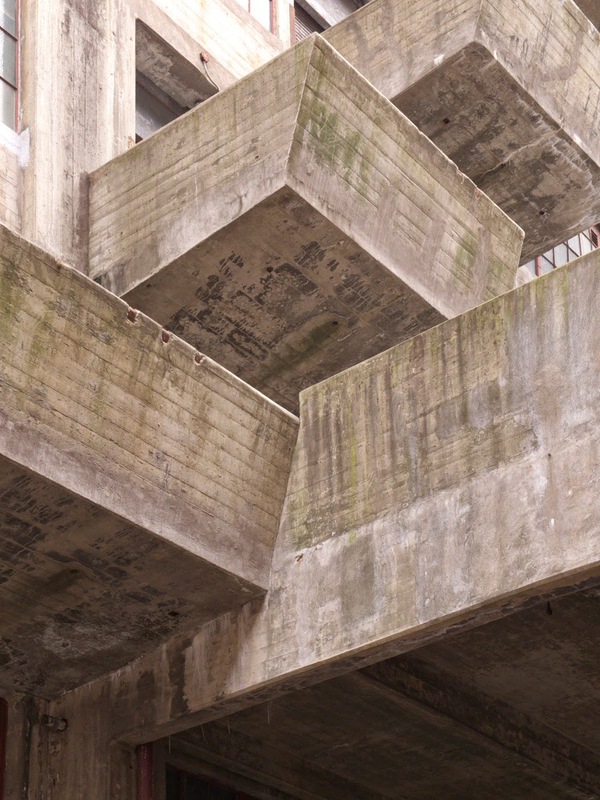 But it is the angled concrete balconies—upper-level loading docks, really—that steal the show. In form and arrangement they appear to be Gilbert's only flourish in the whole building, but they are wholly functional parts of the building, as much as the railroad below and crane above. 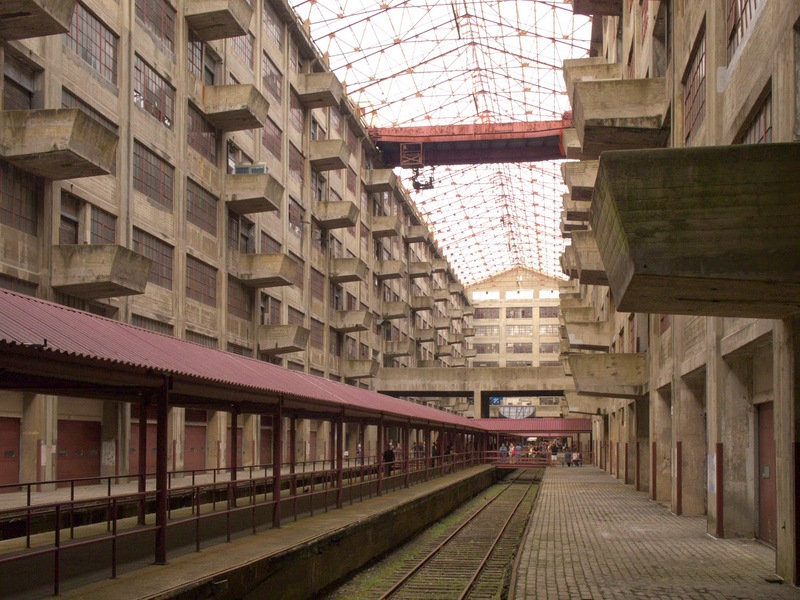 Their angled arrangement allowed cargo from train cars below to be lifted to the various spaces above without interference; a stacked or checkerboard or some other arrangement would have made it difficult to lower cargo without conflicts above. Through the balconies Gilbert gave the immense space a fine texture that also makes its a very idiosyncratic building and the highlight of OHNY this year.